Starting Sunday at midnight, you can submit Your Best Cucumber Recipe* and Your Best Use of Lemon, Thyme and a Grill. It has been such a pleasure to find this group of like-minded food lovers! It has truly been a wonderful experience. And thank you to everyone for your wonderful recipes and tips! I'd like to take this opportunity to add my voice to this crowd of like-minded cooks and food lovers--What a GREAT thing the two of you have created!! I suspect you couldn't have predicted that your "crowd" of Food 52ers would have so much fun and friendly interactions. What you have built is an online community--and a really valuable and supportive one at that! So while I agree that you both derserve a break (and, Merrill, don't you have a wedding to get ready for? ), I also hope that the community and cooking and sharing will continue long after the first cookbook is put to bed. This is just way too fun to stop. Thank you both for your creativity, dedication and love. Thank you so much, drbabs, for your lovely sentiments! Regarding the wedding, all I can say is thank goodness for wonderful mothers who are also excellent party planners! I'm so glad to be back in town for this final Week 52! I love starting my week with all of you fellow cook/food friends/enthousiasts out there. I love spending my week percolating ideas of what I might post; and thoroughly enjoy reading, trying the recipes all of you post and getting to know each other through our love for food and cooking. And now that it's winding down for the first year, I'm suddenly wondering what I'll do next week without it and without all you guys. Food will still be served, but cooking won't be quite as much fun. Hopefully Amanda, Merrill and the food52 mothership group will be taking a much needed vacation. And I know there are plans to do another book. But is this the last week for a little while? I'm still catching up on all the posts from my absence over the last few weeks, so I may have missed postings on this. No worries, CS! We're not taking a break -- just switching gears a little with our summer contests. There will still be opportunities every week to submit your best recipes in pursuit of great prizes and everlasting fame; we're just not "officially" going to start on compiling the next book until September. Congratulations to you, Amanda and Merrill!! You have truly changed the culinary world and made it so much more fun to create, cook, share, critique and, of course, eat! Looking forward to another year with the ever-growing Food52 community and wishing you both a long, lazy vacation! What a lovely comment, Rhonda! Thank you so much for all of your enthusiasm and support. Right back atcha, Liz! I love your food! Anytime you or anyone is in the SF area, you're welcome in my kitchen too for a little cooking, eating, wine, and conversation. You said it! We're very flattered by everyone's congratulations, but really the credit goes to all of you -- and to everyone else behind the scenes who helps keep this site going (and improving) all the time. The best use of crowdsourcing I've ever seen! Glad to hear the fun isn't ending with Week 52. But I hope you guys can get a break/vacation! Don't worry, we'll get a breather at some point this summer! Mazel tov on reaching your first anniversary. This is a wonderful, interactive site, I have enjoyed "meeting" so many like minded cooks. Here's to many more encounters of the same kind. 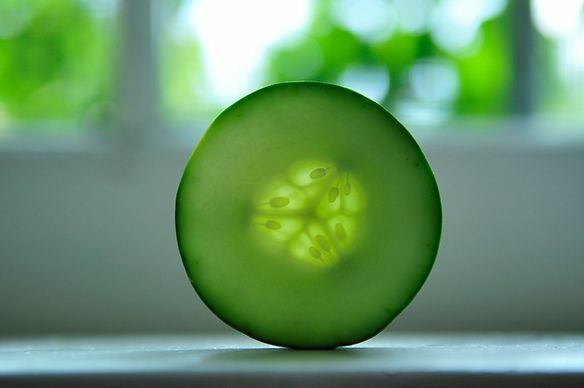 As for cucumbers.... what can I say? I've been playing with them for years in the summertime. They are so refreshing all by themselves, and they lend themselves so well to light refreshment for summer parties. Just slice 'em, spread with a tad of homemade mayo and top with a pink Maine shrimp..... for starters. Thank you! We've so enjoyed meeting everyone too -- most of you virtually, but some in person as well. Hooray! More excitement. So happy that you have had a brilliantly successful first year! We just found a great combo of olive oil, thyme and garlic. I bet we can sneak a lttle lemon in there to have a killer combo. cucumber filled with tuna/mayo mix. The key success remains in the fresh quality mashed tuna meat, top quality mayo, fresh cucumber + dressed with chopped fresh parsley and a slight zest of olive oil. I love this simple recipe since it enhances my lifetime belief that the best food remains in the top freshness, wise selection of top quality ingredients, a 6th sense for the right dressing at the right moment (a mastered slight zest of olive oil + a bit of chopped parsley here outshines the usual heavy salad dressing). Congratulations on a fabulous year! I'm only sad that I discovered Food52 - in Week 51. Looking forward to the book. Thank you -- and not to worry, we're just warming up! More books and more fun site stuff to come. Hope you'll stick around! Thanks, AJ! We echo your sentiments about everyone's amazing contributions to food52. Sweet! This one I can do in my sleep. I'm moving a long distance next week but I can set this up in no time. Something is going to get spatchcocked or crucified next week. Possibly both. I was concerned I wouldn't get a final recipe in but...this will now be a tribute to my new home town where a certain type of grilling rules. game on!!!! That is great. Cheers to food52!!! Ohhhhh man, I picked the right week to be out of Manhattan and up at the Cape where I have a grill! Perfect! Three cheers for A&M - nice sponsorship w/WFoods. Wow. It's so nice to see Food52 reach Week 52 with two very fun contests. Looking forward to having some fun with lemons, thyme and a grill. Thanks -- we really hope everyone has fun with this! 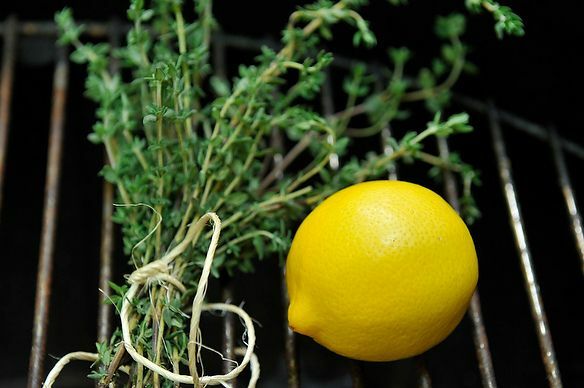 Lemon , thyme and a grill - pretty much a PERFECT combination! The mind reels with possibilities! I still have some cedar fence pickets around here too :-) This is WEEK 52, right? We need to bring out our very best!!! !